Booked two rooms months in advance. I let the hotel know we would be arriving late, after check in time. I called the same day just to confirm with them. When I arrived they told me our rooms were overbooked and they had booked us at another hotel. After a long day we were all exhausted and upset this happened. I don’t understand why they didn’t tell me any of this information over the phone. The guy working the front desk was accomadating but didn’t seem to know what he was doing. Probably would not stay here after this experience. There was no bedding for our third guest in the room, we had to go get it from the desk after our long day as we were in our pajamas and ready to settle down. Not luxurious but clean and comfortable. Staff extremely friendly and helpful. Conveniently close to the Convention Center. Had a quick stay overnight while attending a conference. Pretty standard and fine for what I needed it for. Short stay, but perfectly fine. Breakfast was overcrowded. We arrived after a night flight and wanted to leave our bags at the desk and they told us to go and get breakfast in the dining area. We hadn't even checked in! It was marvelous! The room was clean, I have no complaints at all! Very nice location! The Cochon is a few blocks away! Yum! Hotel is ok but room 201 is right over the entrance and therefore had a high noice level. We had a view of the dumpster. We were awaken by a couple fighting on the street at 4 am. There was a limited amount of breakfast available. Staff was very nice but I do not think I will return. Good location, clean, good overall experience. But, they Charge Extra $ 40 for parking a day!!!! Going through a remodeling project making it a little difficult to maneuver. They allowed us an earlier check in because the room was ready. The room was spacious and immaculately clean. Big points! Daily service, including full breakfast, which I was never able to attend because it ended at 9:00 AM and I had late night events on the convention. They should extend till at least 10:00 AM. Staff was friendly and helpful. Close proximity to the convention center. Best feature was the value for price. Room rate averaged $150 per night, less than other hotels in the Warehouse District. Would do it again in a minute! The hotel was clean. The breakfast was good. The staff was superb. Very close to the Convention Center, a 10 minute walk to the French Quarter, and a short street car ride to the Garden District. 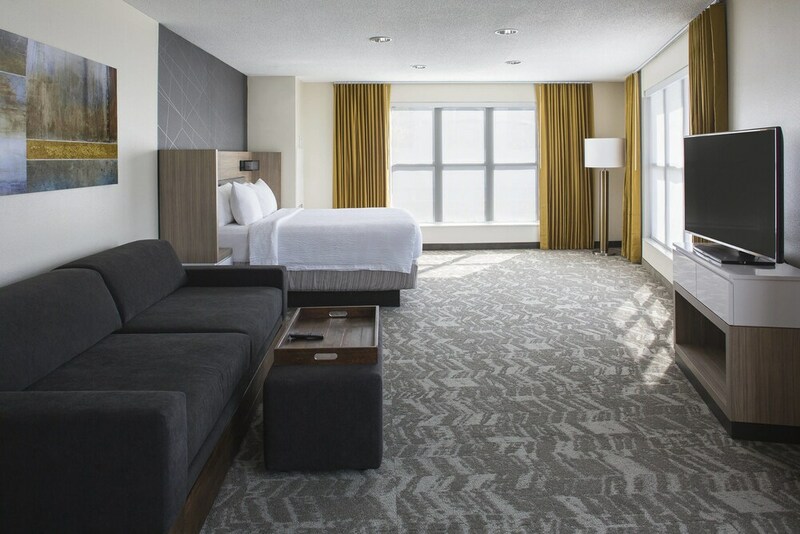 Located in Lower Garden District, SpringHill Suites by Marriott New Orleans DT/Convention Ctr is adjacent to Julia Street Cruise Terminal and within a 10-minute walk of other popular attractions like National World War II Museum. This 3-star hotel welcomes guests with 208 rooms and conveniences like an outdoor pool, free in-room WiFi, and a fitness center. Free buffet breakfast is included with your stay. Guests can expect to find free WiFi and 25-inch a TV with cable channels and pay movies. The bathroom offers hair dryers and free toiletries. Other standard amenities include a sofa bed, a sitting area, and a refrigerator. Guests of SpringHill Suites by Marriott New Orleans DT/Convention Ctr have access to an outdoor pool, a fitness center, and free WiFi in public areas. Valet parking is offered for USD 35.00 per day. The 24-hour front desk has multilingual staff ready to assist with securing valuables and dry cleaning/laundry. Additional amenities include a 24-hour business center, coffee/tea in a common area, and a computer station. Recreation features at SpringHill Suites by Marriott New Orleans DT/Convention Ctr include an outdoor pool and a fitness center. The preferred airport is New Orleans, LA (MSY-Louis Armstrong New Orleans Intl. ): 23-min drive, 15.9 mi/25.6 km.